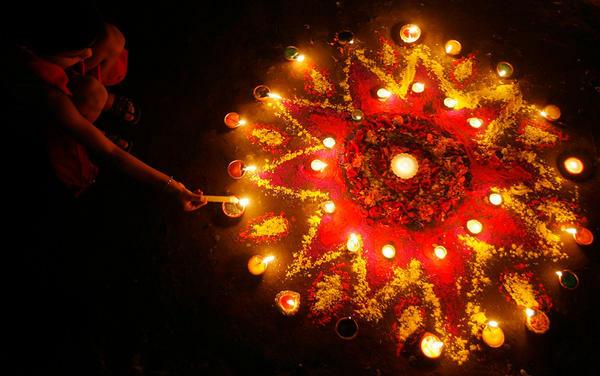 Diwali which is one of the biggest festival of Hindus is being celebrated on Oct 26th this year. Diwali is also the festival of Goddess Laxmi who is the Goddess of prosperity and wealth. It is believed that Ma Laxmi visits our houses during Diwali and brings peace and prosperity in our lives. On Diwali night all Hindus perform Laxmi Puja. Memsaab brings to our readers and visitors the way to perform Laxmi Puja. First the room where the idols of the Gods and Goddesses are to be placed is cleaned. Traditionally the entire house if cleaned and washed a few days before Diwali. Idols of the Goddess Laxmi, Lord Ganesha, Lord Shri Ram, Goddess Sita, Lord Laxman and Lord Hanuman are placed in a Hathi (a traditional structure like a small temple made of clay). Light five pieces of ghee diyas (lamps) in front of the deities to ward of inaspicious elements. Make a Panchamitra with five ingredients of milk, curd, ghee (clarified butter), sugar and Honey. Flowers are placed at the feet of the Gods and Goddesses. Along with this Sindoor (vermillion), Haldi (turmeric), Agarbatti (incense sticks) and Abir (red color) is placed near the Gods and Goddesses. Traditional sweets, mithai, fruits and snackes are kept before the deities as Prasad. Token gold and silver coins bathed in milk are placed near the Gods and Goddesses. Devotional songs, hymns and bhajans are sung so that the atmosphere becomes spiritual. Betel Leaves (Paan) is offered along with Cloves (Laung). Ganesh Puja is a must before Diwali Puja. In fact Lord Ganesha is worshipped before the begining of any Puja. Laxmi Puja is then performed by singing Laxmi Aarti. A thali (a silver or steel plate) is used in which we place flowers, mithai, fruits, lighted diya, lighted dhoop and agarbatti. While the Aarti is being performed, one of the family members can ring the devotional bell which is used during Aartis. After Diwali Puja one can have the Prasad and distribute it to other members of the household. KBC Gets Its First 5 Crore Winner!!! Glimpses From a Big Diwali Bash!